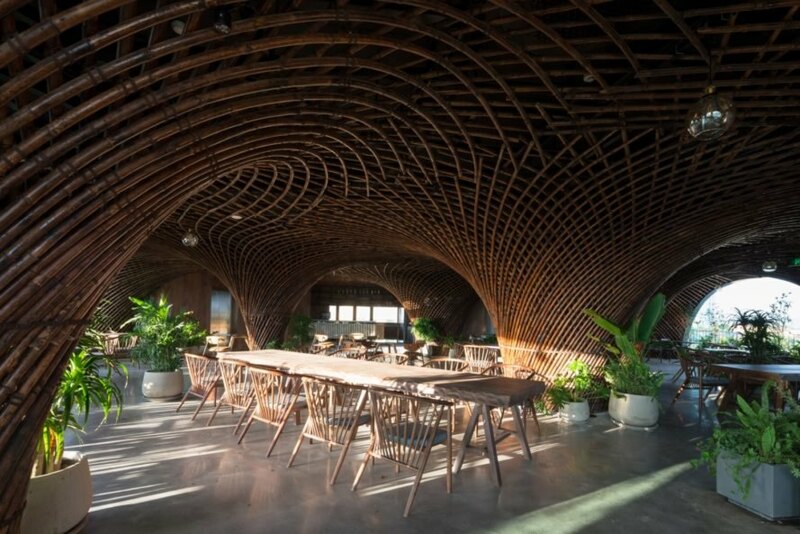 Vietnamese architecture firm Vo Trong Nghia has unveiled their latest example of bamboo brilliance at Nocenco cafe, a renovated rooftop restaurant in the city center of Vinh in central Vietnam. The client asked the firm to insert a unique and eye-catching addition to the top of a seven-story concrete building using local materials. After studying several options, including brick and stone, the architects settled on bamboo to create an airy and lightweight space with dramatic vaulted ceilings. Completed in May of this year, the renovated Nocenco cafe covers an area of 4,700 square feet across two floors; both levels frame vistas over the surrounding low-rise houses, the river, and forest beyond. Most buildings in the area were damaged in the Vietnam War and subsequently renovated with colonial-style concrete facades. Rather than change the building’s existing envelope, Vo Trong Nghia was asked to create an addition that would look iconic and dramatically different from the local building norm. The architects decided to use bamboo and craft a structure that could be easily recognized from the street. “Through our experience, we know bamboo is [easy] to access in this tropical climate which reduces construction time and budget,” says Vo Trong Nghia. “The essence of using bamboo in this project is ‘lightness’…bamboo…can be lifted up by a few workers and easily [transported] to the highest floor by a crane. In addition, it is possible to install the bamboo structure without any additional structural support.” Bamboo was inserted on the rooftop as well as in the restaurant’s seventh floor. A series of bamboo columns were carefully placed to conceal parts of the existing structure and to divide the restaurant into different programmatic functions. The lower level boasts a curvaceous ceiling, while the L-shaped rooftop features two sweeping bamboo vaults and a soaring domed space for spectacular effect.